I think you should have the carpet stretched first. It is important to get the carpet stretched so the backing does not seperate where the wrinkles are in the carpet. When you do have your carpet stretched make sure they are using a power stretcher. Pulling the carpet from one wall to the other with poles. After the carpet is stretched , if it is done right the carpet will not wrinkle after getting your carpet cleaned. Where the wrinkles were the carpet will have dirty and worn areas where the bumps were from people dragging their feet over the bumps. Then the carpet cleaner will try to make it look even again, this is why you should get the carpets stretched first. 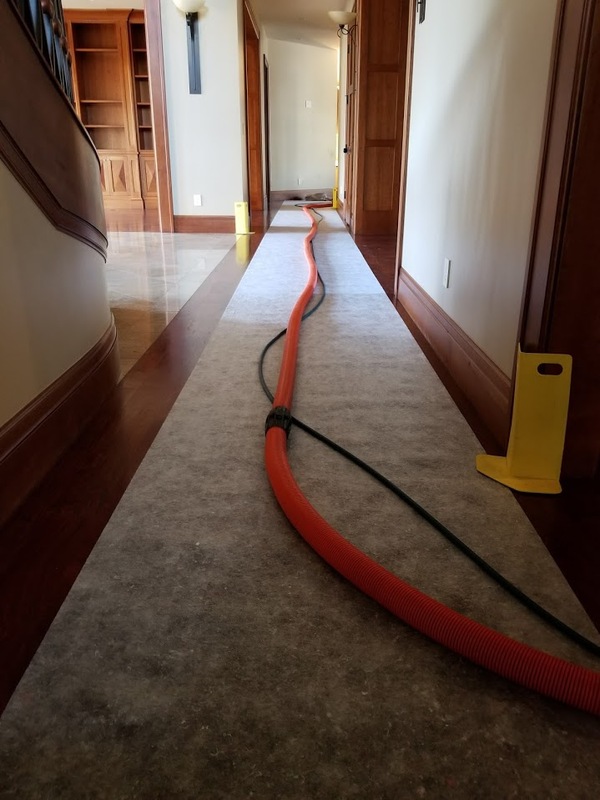 A lot of times there is a bunch of loose carpet fibers all over the carpet after the carpet layers are done and the carpet cleaner can make sure to pick up all of the loose fibers with their vacuum cleaner. The carpet cleaning should always be the last thing done to make sure the carpets look, smell and feel great, ready to get back to living in your home. When you are ready to have your carpets cleaned give us a call 801-756-2275 the Jeff and Judy team, a husband and wife team that care about your home and carpet. Here is a link on Stainmaster carpet saying how often you should get your carpets cleaned and how to take care of your carpets. Apply the Pro-Solve to the deposit. Allow dwell time. Up to 2 minutes. Scrape deposit and Pro-Solve residue from carpet fibers. Apply Power Gel to the area and agitate to emulsify any residues. Apply ARA to the area to prevent any residues from attracting soil. They were able to get gray, magnetic lab putty out of the couch. Did a great job! I would highly recommend. It is just the little things we do when we are carpet cleaning your home that is going to make a difference. When you call us you will get Jeff or Judy on the phone to answer your questions, with 30 years of experence in the carpet cleaning industry and we have been in business now for 24 years. When the Jeff and Judy team comes out to your home in Utah County you are getting someone with lots of knolledge, experence and good up to date equipment. That really helps because you want the right products and equipment for the type of carpet you have and we will know how to make your carpet thoroughly clean and how to get out all the spots in the carpet. So don’t take a chance of a carpet cleaning employee comming to your come , they might have worked there for 3 years or maybe just two weeks and do you want to take that chance. We start off and listen to all your concerns that you have about your floor, then we bring in floor runners, tarps, blankets, towels, corners guards, DUK guards, Huggers, seal-a-door to protect your home and lawn pic’s to protect your yard. We cover all the floor we are not cleaning, We also bring in plastic tabs and styrofoam blocks to put under furniture that we have moved. We try to clean as much of the carpet as we can. It helps to have two people to move stuff around. Jeff presprays the carpet and Judy scrubs the carpet with a Brushpro, then Jeff uses a spinner tool and then goes back over it with a carpet cleaning wand, then we set up an airmover in each room to help the drying process, both of us looks around for spots in the carpet. When we are all done we walk around with you to make sure you are happy with the carpet cleaning job we did for you, We do all this because we really care about doing the very best job we can do. Take a look at this video and you can get an idea on what we do for you when we are cleaning the carpets in your home. Finding dog or cat urine in the carpet is really easy using a really good UV light (or black light) and moisture probe. The UV light will tell you where the urine damage is in the carpet and the moisture probe will detect the urine salts in the carpet and the pad. Not everything is urine that the UV light detects if it is a yellow, greenish glow it is urine in the carpet. If it is a bright white it is a cleaning product in the carpet. It will also detect drink spills and all kinds of other stuff. The urine salts pulls moisture from the air into the carpet keeping it wet for months allowing for bacteria to grow and it is the bacteria that leaves the bad odor in the room. This is where the moisture probe comes in handy it detect the urine in the pad and the sub floor. If you have a dog the urine might be next to furniture leg or in the middle of the room or next to the door. If it is a cat, in most cases, it is next to the wall somewhere. This is the UV light and the moisture probe that we use when we come out to your home. This is a High flux UV crime scene light. I am using a Dri-eaz Hydrosensr 2 to detect the urine in the pad. Sometimes the baseboards and the drywall need to be treated or replaced, you can see this is a cat because they like to pee next to the walls and baseboards. If you pull back the carpet, you will have a good idea on how bad the urine damage is and you might have to replace the pad and seal the sub floor. In some cases, you might need to get new carpet. This is a good example of a dog that left urine on the carpet.